A new app has been developed to provide life-saving support to construction workers and tackle the shocking levels of suicide in the industry. Two construction workers take their own life every single working day and stress, anxiety and depression currently accounts for a fifth of all work-related illness. The free mental health app is 100% confidential will be launched on Friday 7th December 2018 at the Lighthouse Club construction charity’s annual Christmas Lunch at the Westminster Park Plaza Hotel in London. The new ‘Construction Industry Helpline’ app provides vital information, advice and guidance on many wellbeing topics including stress, anxiety, depression, anger and suicidal thoughts, as well areas such as anger management, drug and alcohol dependency, debt management, legal advice, and emergency financial aid. 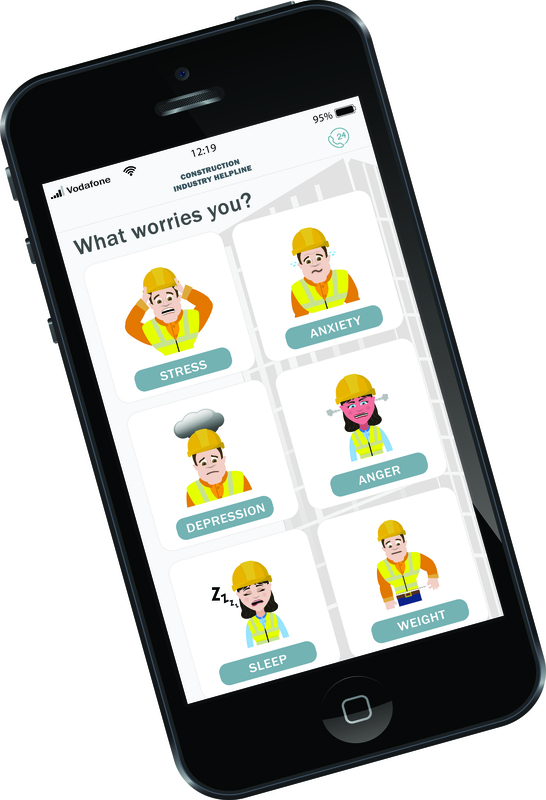 The app is a collaboration between the Lighthouse Construction Industry Charity, construction software firm ‘COINS’ and ‘Building Mental Health’, aims to address the shocking levels of mental illness and suicide in the construction industry. Bill Hill, CEO of the Lighthouse Construction Industry Charity said: 'The app complements our existing 24/7 Construction Industry Helpline and is aimed at construction workers and their families. You can download the Construction Industry Helpline app on Google Play or the App Store.